The Iranian and Azerbaijani presidents have emphasized the need for the further enhancement of Tehran-Baku relations in different domains, particularly in the energy sector. In a meeting with his Azerbaijani counterpart Ilham Aliyev in the Russian city of Astrakhan, Iranian President Hassan Rouhani underlined the strong determination of both neighboring states to bolster bilateral cooperation in all areas. Tehran and Baku have great potential for the expansion of bilateral cooperation, particularly in the fields of energy, commerce, environment and tourism, Rouhani stated, saying the Iran-Azerbaijan Joint Economic Commission should play a more active role in this regard. The Iranian chief executive also called for closer cooperation between Tehran and Baku on issues of regional and international importance, saying both countries should adopt coordinated stances in the global arena. 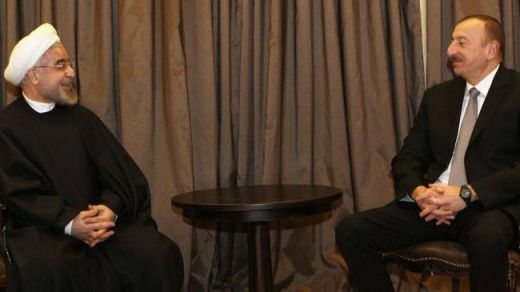 “The security and development of both countries are interrelated and we should not allow the states that are against the promotion of friendly relations between the two countries to hamper these ties,” Rouhani noted. Aliyev, in turn, said his country was keen to broaden relations with the Islamic Republic in all domains, expressing hope that the two sides could reach good agreements in the areas of commerce and tourism during Rouhani’s upcoming visit to Baku. The Iranian and Azerbaijani presidents are in Astrakhan to take part in the 4th summit of the Caspian Sea littoral states. Iran, the Republic of Azerbaijan, Russia, Kazakhstan, and Turkmenistan are the five littoral states of the Caspian Sea.